Dr. Hammond was born and raised in Decatur, AL. He graduated from Austin High School and is married to the former Gayle Wilkerson of Birmingham. Gayle has a degree in Hospital Administration from Auburn University and is former Director of Business Affairs for Bay Medical Center in Panama City, FL. She is now a stay-at-home Mom. They have two school aged children, Lauren and Nicholas. Lauren is very involved in dance, along with school activities and her friends. Nicholas is five years younger and enjoys many outdoor activities and sports, along with computer games. Dr. Hammond received his B.S. degree with high honors from Auburn University in 1979, majoring in chemistry. He was accepted at UAB School of Dentistry after three years of college. During his senior year of dental school, Dr. Hammond was named “Best All Around Male Student” by the Pedodontic Department. Upon graduation from dental school in 1982, he completed a year long residency at the Veteran’s Administration Hospital in Birmingham, which included rotations in Oral Surgery and Periodontics. He received his Masters of Science in Periodontics in 1986 from Indiana University School of Dentistry. His master’s thesis was entitled, Long-term Effects of Orthodontic Treatment on Periodontal Health Status. While in his residency, he published an article on Treatment of Medically Compromised Patients. 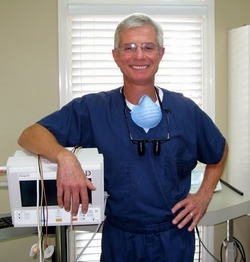 Upon graduation, he returned to North Alabama and established his periodontal practice in 1986. Dr. Hammond and his staff have continued to provide a full range of periodontal services for over twenty years. In 1993, conscious I.V. sedation was incorporated into the practice to provide increased patient safety and comfort during all procedures. Dr. Hammond and his clinical staff are certified in Advanced Cardiac Life Support. They are examined by the Board of Dental Examiners on a regular basis to assure effectiveness and competency in management of medical emergencies should they arise. In recent years there has been a paradigm shift in periodontics to include periodontal surgery and dental implants. The aesthetic enhancement of periodontal plastic soft tissues to improve a patient’s smile and complement restorative procedures can now be performed with increased predictability and comfort. Dr. Hammond has completed an intensive mini-residency in the surgical and prosthetic aspects of dental implants at the Misch International Implant Institute in Detroit, MI. He also completed intensive continuing education and is a Recognized Specialist at the renowned Kois Center in Seattle, WA. This qualifies him to participate in the planning as well as placement of dental implants. Dr. Hammond and his staff feel state of the art technology is also an essential part of being able to provide the highest level of service. Utilizing computer assisted digital x-rays increases the diagnostic capabilities of x-rays, while decreasing radiation exposure. This practice is also one of the few in Alabama to offer in-office Cone-Beam CT scanning capabilities. This allows for immediate and accurate assessment of bone volume in preparation for safe and predictable implant therapy. Dr. Hammond maintains a membership in the American Academy of Periodontology, the Southern Academy of Periodontolgy, the American Academy of Implant Dentistry and the International Congress of Oral Implantolgy. He is an Associate Fellow of the Academy of Implant Dentistry, and a Fellow of the International Congress of Oral Implantology. Dr. Hammond is also one of the few implant dentists in Alabama to achieve Diplomate status in the American Board of Oral Implantology. He is absolutely committed to providing the exceptional, state of the art periodontal and implant therapy for which this practice has been known.